The November KFF Health Tracking Poll, conducted the week after the 2018 midterm election, finds a majority of the public wants the new Democratic majority in the U.S. House of Representatives to work with Republicans on legislation to address the major problems facing the country as well as conduct oversight of the Trump administration’s actions on policies such as health care. 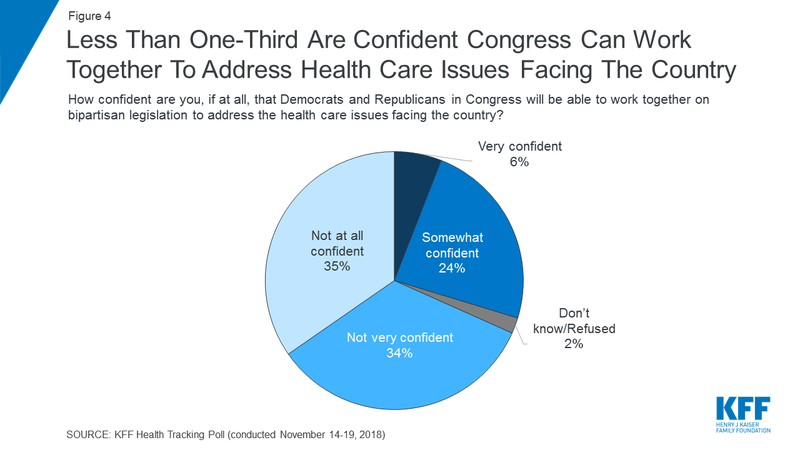 Yet, few Americans are “very confident” (6 percent) that Republicans and Democrats in Congress will be able to work on bipartisan legislation to address the health care issues facing the country. The midterm elections brought Medicaid expansion to three additional states, bringing the total number of states that have expanded their Medicaid programs to cover more low-income uninsured adults to 37 (including Washington, D.C.). Those living in states that have not expanded their Medicaid programs continue to hold a favorable view of Medicaid expansion and most would like to see their state expand their Medicaid program. And as a possible indicator of how some other states may expand their Medicaid programs in the future, most of those living in a non-expansion state say that if their state government chooses not to expand, voters themselves should be able to decide if their state expands their Medicaid program. The new Democratic majority in the House all but guarantees the Affordable Care Act (ACA) will remain the law of the land for at least the next two years. The most recent tracking poll finds a slight uptick – largely driven by Democrats – in the overall favorability of the law (53 percent) and many of the ACA’s provisions continue to be quite popular with a majority of the public. 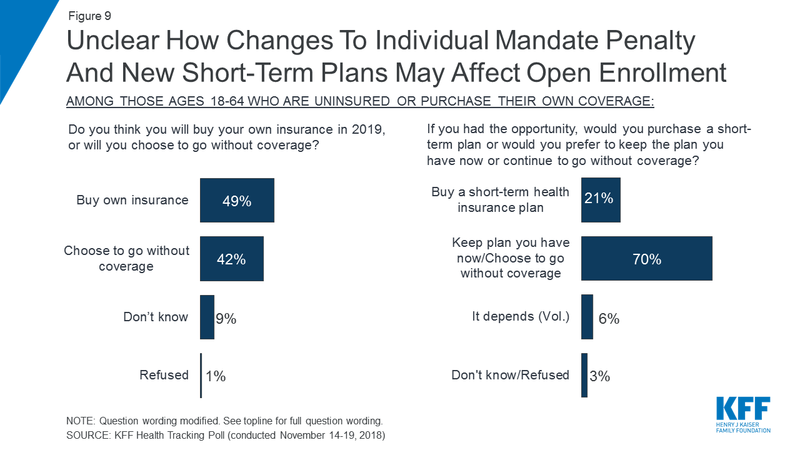 But the poll also finds the public is largely unaware about the law’s sixth open enrollment period, and four in ten 18-64 year olds who buy their own insurance or are currently uninsured say they will choose to go without coverage in 2019. A divided Congress does not mean that the coming year will not see any changes to the country’s health care system. There is an impending lawsuit, Texas v. United States, which may end the ACA’s protections for people with pre-existing medical conditions as well as the Trump administration’s recent actions allowing employers to be exempt from covering the full cost of birth control for their employees if they oppose to it due to religious or moral reasons, which could lead to substantial changes to health coverage for many Americans. This month’s tracking poll examines the public’s support for these proposed changes and examines the malleability of these opinions. With Democratic gains in the U.S. House of Representatives during the 2018 midterm election, Democrats and Republicans will split control of Congress next year. These results will mean that President Trump will have a divided Congress for the first time in his presidency. 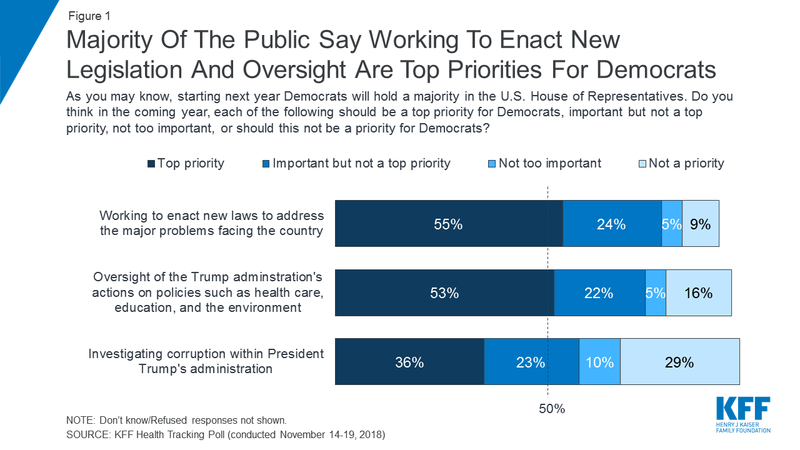 About half of the public (53 percent) say oversight of the Trump administration’s actions on policies such as health care, education, and the environment should be a “top priority” for House Democrats in the coming year. 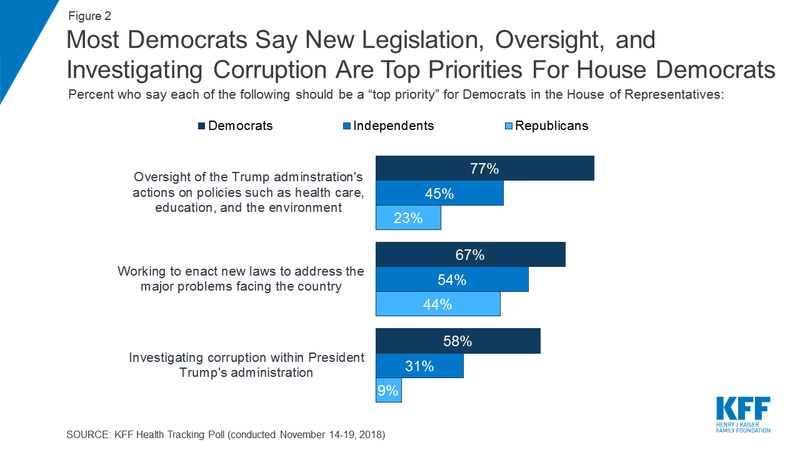 This is similar to the share (55 percent) who say that working to enact new laws to address the major problems facing the country should be a “top priority” for House Democrats in the coming year and substantially larger than the share who say investigating corruption within President Trump’s administration should be a “top priority” (36 percent). Unsurprisingly, the share of partisans who say each of these should be a “top priority” for Democrats in the U.S. House of Representatives varies drastically; majorities of Democrats saying conducting oversight (77 percent), working to enact legislation (67 percent), and investigating corruption (58 percent) should all be top priorities for the coming year. A majority of independents (54 percent) say working to enact legislation should be a “top priority,” while less than half of Republicans say any of these – including working to enact legislation – should be “a top priority” for House Democrats. Similar to the issues driving voters in the 2018 midterm elections, the most recent KFF Health Tracking Poll finds immigration and health care as the top issues the public want to see the next Congress act on in 2019 with the issues offered largely driven by party identification. Overall, about one-fifth of voters offer immigration or border security (21 percent) when asked to say in their own words the issue Congress should work on next year. This is similar to the share of the public who offer health care (20 percent) as the top issue they want to see the next Congress work on. Fewer offer gun control/legislation (8 percent), tax reform (4 percent), or education (4 percent) as the issues they want to see Congress act on in 2019. Four times as many Republicans (41 percent) offer immigration/border security as the issue they would most like the next Congress to act on in 2019 as Democrats (10 percent). On the other hand, health care is the top issue for Democrats. One-fourth of Democrats (27 percent) say health care is the issue they would most like to see the next Congress act on, compared to 11 percent of Republicans who say the same. Independents are divided across the top two issues, with similar shares offering immigration/border security (22 percent) and health care (21 percent) as the issues they want to see Congress work on. Note: Only top five responses shown. Question asked of half sample. 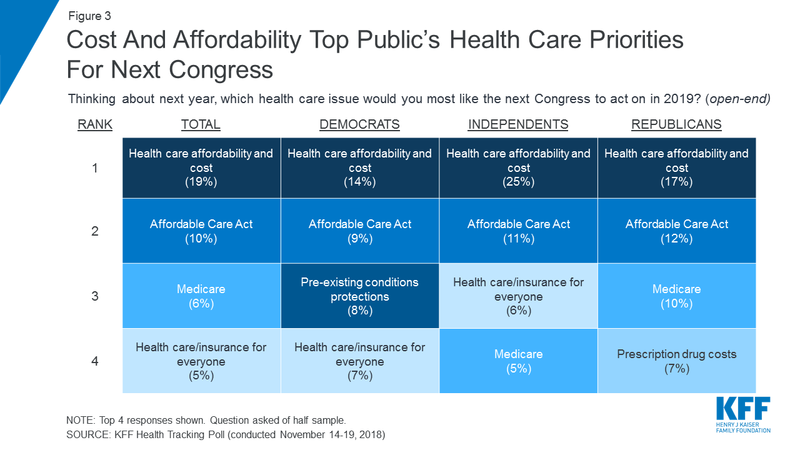 When asked which health care issue they would most like to see the next Congress act on in 2019, more Americans offer issues around health care affordability and cost (19 percent) than other health care issues including the 2010 Affordable Care Act (ACA) (10 percent) or Medicare (6 percent). Health care affordability and cost are also the most frequently mentioned health care issues by Democrats (14 percent), independents (25 percent), and Republicans (17 percent). The ACA is the second most frequently mentioned health care issue among partisans, with Democrats saying they want to see Congress “protecting or improving the ACA” while Republicans say they want to see the next Congress “repealing the ACA.” Independents are divided on this issue, with similar shares saying they want to see Congress repealing and protecting the 2010 health care law. While there appears to be consensus among the public on what health care issue they want to see Congress work on next year, not quite one-third are confident that Democrats and Republicans in Congress will be able to work together on bipartisan legislation to address the health care issues facing the country. In fact, seven in ten say they are either “not very confident” (34 percent) or “not at all confident” (35 percent) that Congress will be able to work on such bipartisan legislation, while fewer are confident, either “very confident” (six percent) or “somewhat confident” (24 percent), in Congress being able to work together. Democrats are slightly more confident in the ability of Democrats and Republicans in Congress to be able to work together on bipartisan health care legislation (41 percent) compared to independents (27 percent) and Republicans (19 percent); yet, a majority across party identification say they are either “not very confident” or “not at all confident” (58 percent, 72 percent, and 79 percent, respectively). The 2018 midterm elections have major implications for both the future of the 2010 health care law known as the Affordable Care Act (ACA) as well as one of its most popular provisions – individual state’s expansion of the Medicaid program for low-income people. 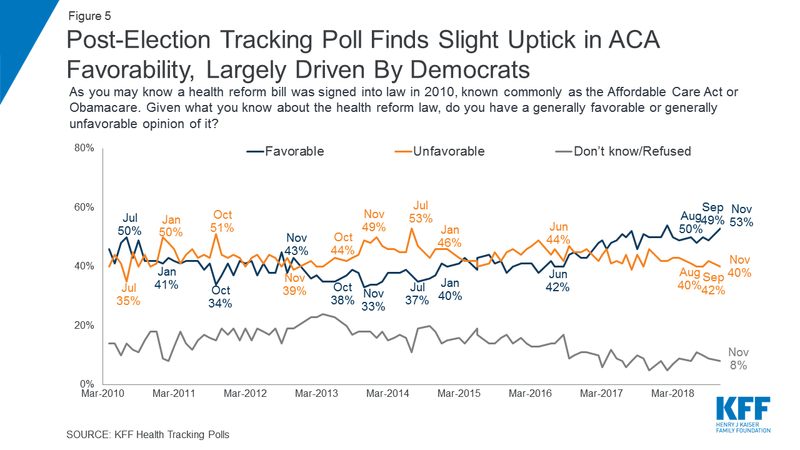 With Democrats regaining a majority in the U.S. House of Representatives for the first time since 2010, and without continued efforts among Republicans to repeal the ACA, the latest KFF Tracking Poll finds a slight uptick in the public’s view of the law with 53 percent saying they view law favorably compared to four in ten who have an unfavorable view of the law. This slight shift is largely driven by Democrats with about eight in ten saying they have a favorable opinion of the law, including about half (48 percent) who have a “very favorable” view. Similarly, three-fourths of Republicans (76 percent) continue to view the law unfavorably with more than half (54 percent) saying they have a “very unfavorable” opinion of the law. Similar to previous KFF Tracking Polls, many of the ACA’s provisions continue to be quite popular, even across party lines. A majority of the public – regardless of party identification – hold favorable views of all of the ACA’s provisions with one exception (fewer than half of Republicans say they have a favorable opinion of the Medicare payroll tax increases on earnings for upper-income Americans). Note. Some items asked of half samples. In previous KFF Health Tracking Polls, one of the ACA’s provisions – the individual mandate which required nearly all Americans have health insurance or pay a fine – was consistently viewed unfavorably by a majority of the public. As part of the federal tax bill passed in 2017, Congress zeroed out the dollar amount and percentage of income penalties imposed by the individual mandate. 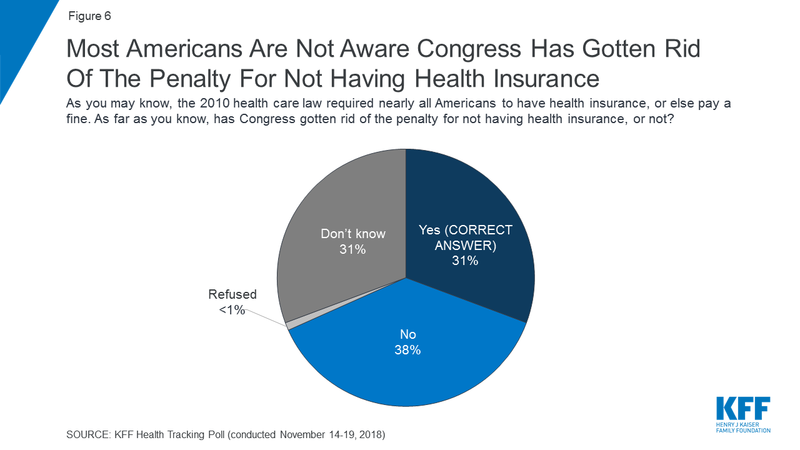 Overall, three in ten Americans (31 percent) are aware that Congress has gotten rid of the penalty for not having health insurance, while four in ten (38 percent) incorrectly say Congress has not gotten rid of this penalty and an additional three in ten (31 percent) are unsure. The results are similar among those under 65 years old who either buy their own insurance or are currently uninsured with three in ten (31 percent) aware Congress has gotten rid of the penalty for not having health insurance. Three states (Idaho, Nebraska, and Utah) voted during the 2018 election to expand their Medicaid program to cover more low-income residents, bringing the total number of states that have expanded their Medicaid programs to 37 states including Washington, D.C. Overall, about three-fourths of the public – including 77 percent of those living in non-expansion states – have a favorable view of the ACA’s provision that gives states the option of expanding their existing Medicaid program to cover more low-income, uninsured adults. 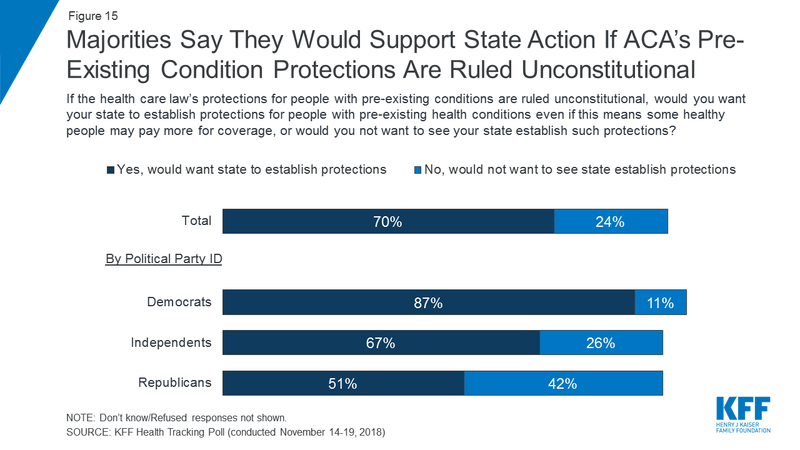 In addition, a majority (59 percent) of those living in non-expansion states would like to see their state expand Medicaid to cover more low-income uninsured people while one-third (34 percent) say they want to see their state keep Medicaid as it is today. A majority of Democrats and Democratic-leaning independents say they want to see their state expand Medicaid (84 percent) while most Republicans and Republican-leaning independents want to see their state keep Medicaid as it is today (65 percent). 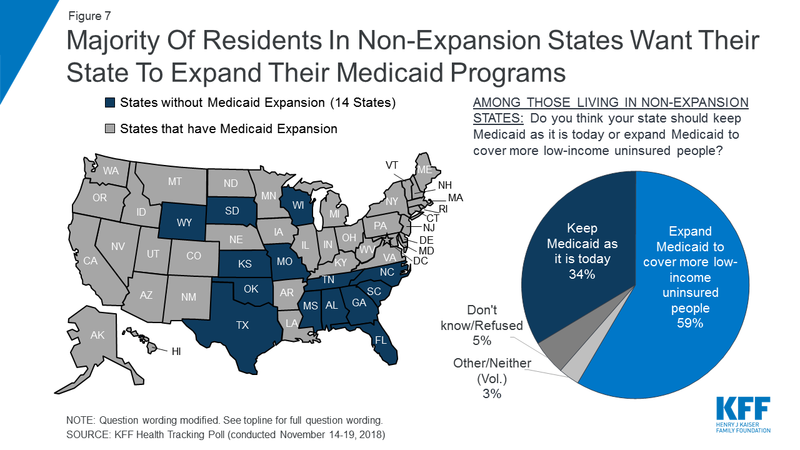 Among those living in states without Medicaid expansion who want to see their state expand their Medicaid program, nearly nine in ten (51 percent of all residents living in non-expansion states) say that if their governor and state government choose not to expand Medicaid, voters themselves should be able to decide if their state expands Medicaid. 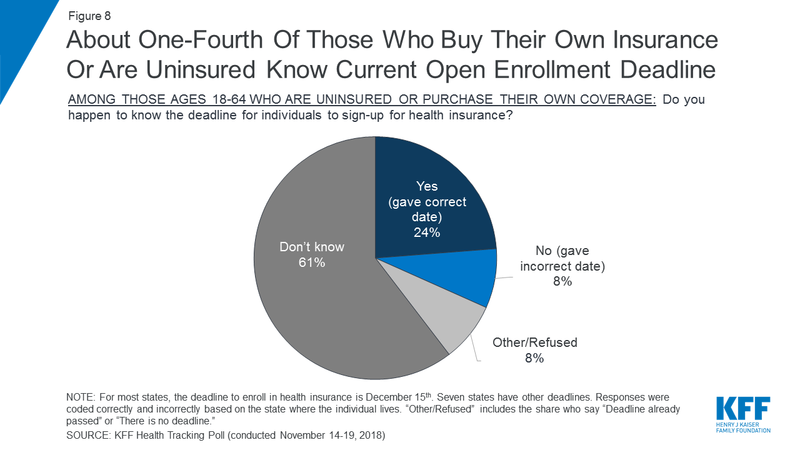 The most recent KFF Tracking Poll finds a majority of the group most directly affected by open enrollment (those 18-64 years old who either purchase their own insurance or are currently uninsured) are unaware of the current open enrollment deadlines. About one-fourth (24 percent) of this group is aware of the current deadline to buy insurance for 2019 while six in ten (61 percent) say they “do not know” the deadline and 16 percent either offer the wrong date, incorrectly say there is no deadline or that the deadline has passed, or refuse to answer the question. Slightly less than half (45 percent) of those 18-64 who either purchase their own insurance or are currently uninsured, say they have heard or seen any ads in the past thirty days from an insurance company attempting to sell health insurance. Fewer – about three in ten (31 percent) say they have heard or seen any information about how to get health insurance under the health care law. This year’s open enrollment period has two major changes brought about by Republicans and President Trump’s administration: the removal of the penalty for not having health insurance and the introduction of short-term health insurance plans. About half of 18-64 year olds who buy their own insurance or are currently uninsured say they plan to buy their own insurance in 2019, despite the elimination of the fine for people who don’t have health insurance, while four in ten (42 percent) say they will choose to go without coverage in 2019. One option available to those who buy their own insurance that would not have satisfied the ACA individual mandate in previous years are short-term health insurance plans. These plans cost significantly less than ACA-compliant plans but provide fewer benefits and may not pay for care for some pre-existing medical conditions.3 About one-fifth (21 percent) of those under the age of 65 who buy their own insurance or are currently uninsured say that if they had the opportunity, they would want to purchase a short-term plan. Seven in ten say they would either continue going without coverage or keep the plan they have now. In recent months, the Trump administration has announced several actions aimed at different aspects of the U.S. health care system. 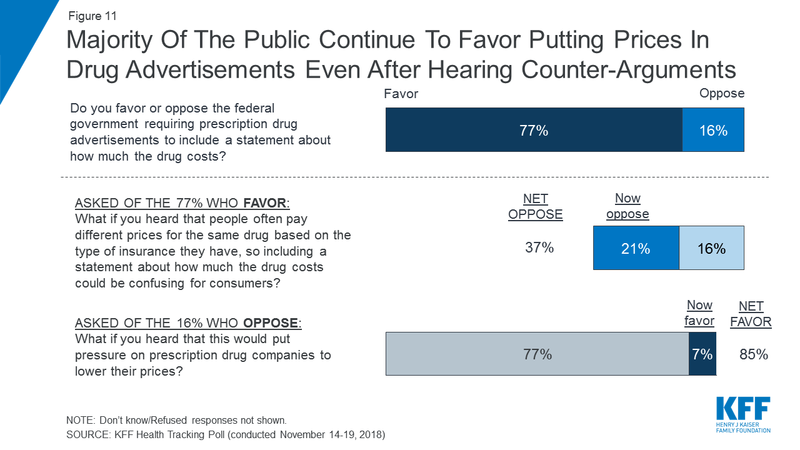 The most recent KFF Tracking Poll finds the public supports the Trump administration’s proposed actions on prescription drug advertisements, even after hearing counter-arguments. The public is more divided on the administration’s actions on women’s health and protections for people with pre-existing conditions. Earlier this year, President Trump announced a series of ideas aimed at lowering the price of prescription drugs. One of its key elements is to require drug manufacturers to publish list prices for their prescription drugs in television advertisements. 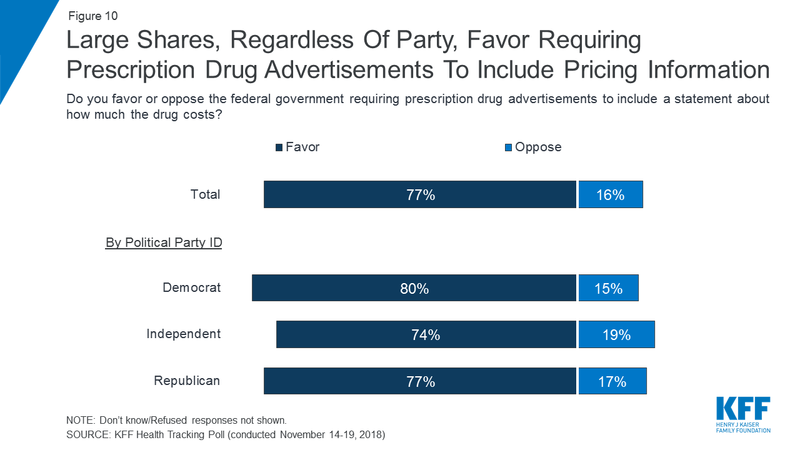 About three-fourths (77 percent) favor the federal government requiring prescription drug advertisements to include a statement about how much the drug costs. In a rare instance of bipartisanship, this policy proposal is supported by a majority of Democrats (80 percent), independents (74 percent) and Republicans (77 percent). After President Trump announced this proposal, there was some debate about how this could be implemented with opponents saying that since people often pay different prices for the same drug based on the type of insurance they have, including a price in a drug advertisement could be confusing to consumers. About one-fifth of those who originally supported this proposal change their minds after hearing this counter-argument, leaving a slight majority of the public (53 percent) continuing to support this proposal. On the other side of the debate, nearly half of those (7 percent of total) who originally opposed this proposal change their minds after hearing that putting the price of a drug in an advertisement would put pressure on drug companies to lower their prices. On November 15, 2018, the Trump Administration issued final regulations expanding the types of employers that may be exempt from the Affordable Care Act’s (ACA) contraceptive coverage requirement to all nonprofit and closely-held for-profit employers with objections to contraceptive coverage based on religious beliefs or moral convictions, including private institutions of higher education that issue student health plans.4 Overall, six in ten (57 percent) of the public, including most women, oppose allowing employers to be exempt from the requirement to cover the full cost of prescription birth control in their plans if they object to it for religious or moral reasons. 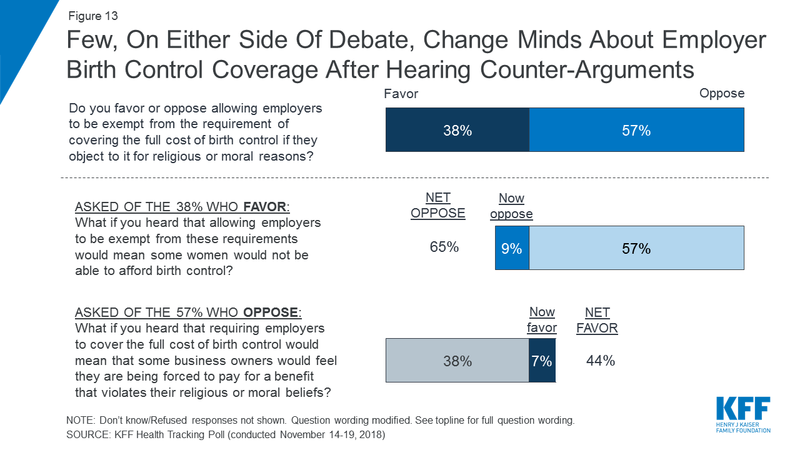 Few individuals, on either side of the debate, change their minds about employers being exempt from covering the cost of prescription birth control for religious or moral reasons after hearing counter-arguments. 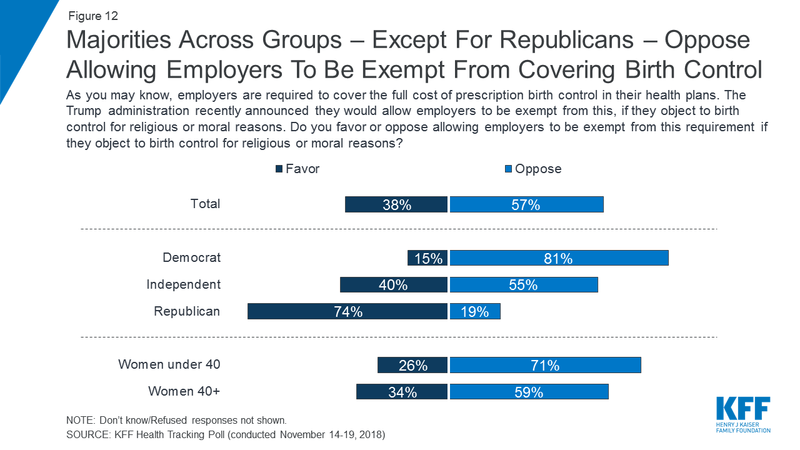 About one-fourth (9 percent of total) change their minds and now oppose employer exemptions after hearing that this means some women would not be able to afford birth control. On the other side of the argument, one in eight (7 percent of total) now favor this exemption if they heard that some business owners feel like they are being forced to pay for a benefit that violates their religious or moral beliefs. In June 2018, President Trump’s administration announced – as part of a lawsuit known as Texas v. United States, brought by 20 Republican state attorneys general – it will no longer defend the ACA’s protections for people with pre-existing medical conditions. These provisions prohibit insurance companies from denying coverage based on a person’s medical history (known as guaranteed issue), and prohibit insurance companies from charging those with pre-existing conditions more for coverage (known as community rating). The impending suit, Texas v. United States, will decide, among other things, whether both of these protections are unconstitutional and if they will be deemed invalid beginning on January 1, 2019. 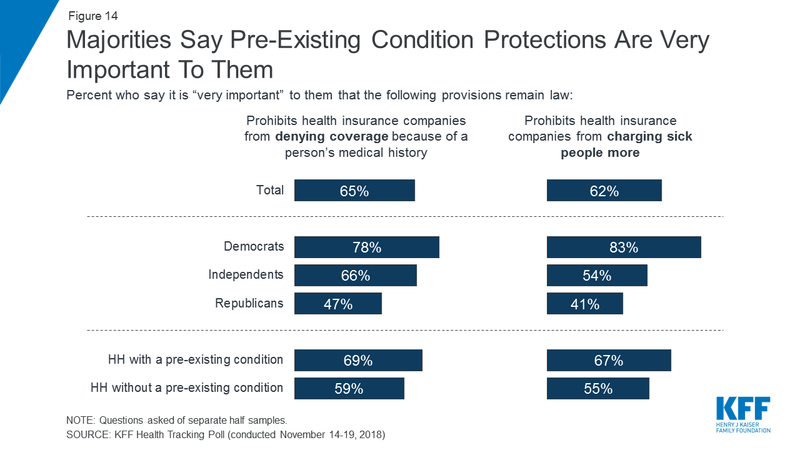 If the judge ruling on Texas v. United States decides the ACA’s protections for people with pre-existing conditions are unconstitutional, a majority of the public – including 87 percent of Democrats, 67 percent of independents, and about half of Republicans – say they would want their state to establish protections for people with pre-existing health conditions, even if this means some healthy people may pay more for coverage.